The poplars that I found near Broadford may be Alnus cordata (Italian alder) according to Richard Jinks on the basis of my photos. However, this does not often seed freely. Confirmation will require a specimen later in the season. I think the Raasay hedgehog hibernated in my compost heap as I found a hole in it as though something had climbed out. No recent sign of rabbits in the garden. 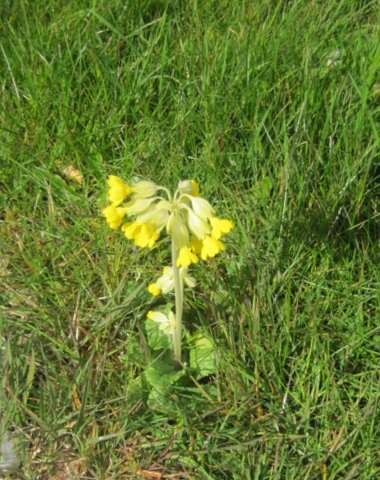 Morag Henriksen has found a cowslip (Primula veris) in Harrapool – the result of scattering of wild flower seed. There are many more in a nearby garden. This is not native hereabouts. I am collecting flies for Murdo MacDonald this year. No-one has yet recorded a housefly in the Highlands. Every Vice-county is supposed to produce at least a draft Rare Plants Register by 2019. Following an offer of assistance from Chris Metherell, I have been setting to and have produced the taxon list for it. – Nationally important – listed in Schedule 8 of the Wildlife and Countryside Act 1981 or listed as occurring in IUCN categories CR (critically endangered), EN (endangered), VU (vulnerable) and NT (near threatened) in the British Red Data Books for Vascular Plants or nationally rare, occurring in 15 or fewer 10km squares in Britain or nationally scarce, occurring in between 16 and 100 10km squares in Britain. Those that qualify under local criteria can be trickier: rare (present in 3 sites or fewer in the Vice-county and do not fall into the above categories. In this context a ‘site’ is a discrete area within a moveable kilometre square) or scarce (present in 4 -10 sites in the Vice-county and do not fall into the above categories) or extinct in the Vice-county. There are numerous issues that make selection difficult – single, old, sometimes anonymous records of a species, changes in taxonomic treatment over the years and in one case a subspecies that is either recorded in error or is too common to be included and in any case is recorded almost entirely only at the 10km square level and so is difficult to check. I have sent my list, which currently comprises 194 taxa, to Chris who has an automated process for basic formatting and adding national status and distributional details. During the season I will try to check on some taxa in need of attention and next winter I intend to finish the job by adding a summary of records for each taxon. A few taxa are still in a holding category. I shall have to make my mind up about these before the final publication. This will be very much a first attempt. Updates will be needed in the future.